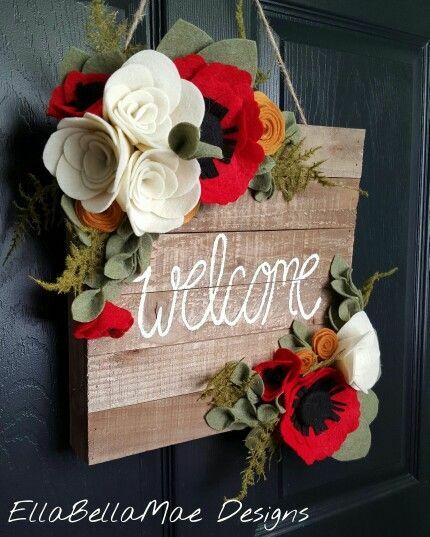 INSIDE: A collection of 10 unique and creative outdoor fall door wreaths to make for DIY autumn home decorating. Anyone ready for some cooler weather? Is it time to pack away the flip flops in exchange for jeans and boots? Even if the weather isn’t quite as crisp as you’d like (hello Arizona! ), at least you can bring out the fall colors and decorate as though the leaves are falling off the trees! 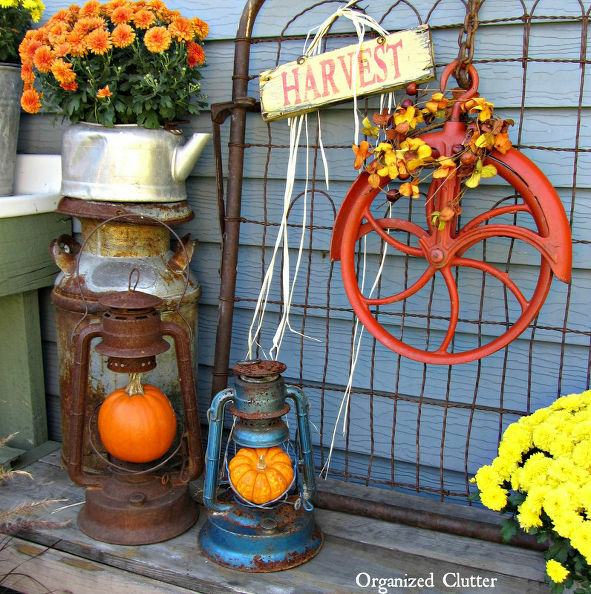 I’ve gathered 10 really fun and creative fall wreath ideas to help you start thinking in terms of oranges and greens and browns. Pull out the glue and floral wire, and get ready to Do-It-Yourself an outdoor fall door wreaths! Wreaths are so much fun and add the perfect welcoming touch to your door. And in my opinion, the more whimsy and eclectic, the better! Here’s to finding some new and great ideas for your home. Courtesy of my home country Canada, maple leaves glued onto a wire coat hanger. Use weathered, everyday items as your wreath base and add a few seasonal touches. 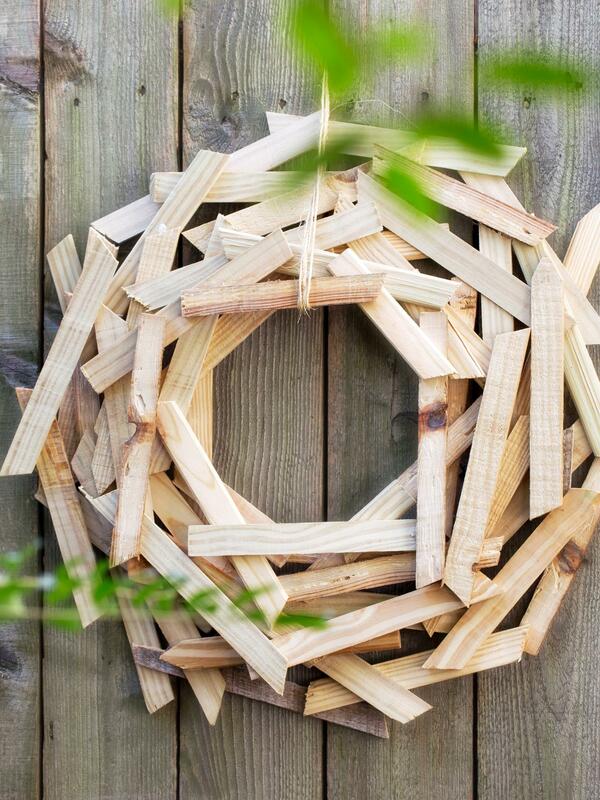 Wood scraps, glued together, form a super unique weather-proof wreath. Take clothespins, painted in fall-like colors or left natural, to create a wreath. Pretty clippy! 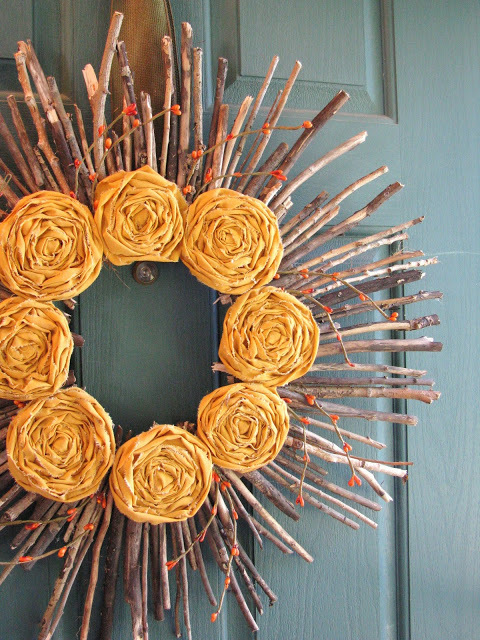 Sticks found throughout your yard formed into a cute, weather-proof fall wreath adorned with cute fabric flowers. Can you believe this wreath is made from pool noodles? Love the square shape! Use faux copper and felt leaves to make a colorful fall wreath. Felt and wood “Welcome” sign. 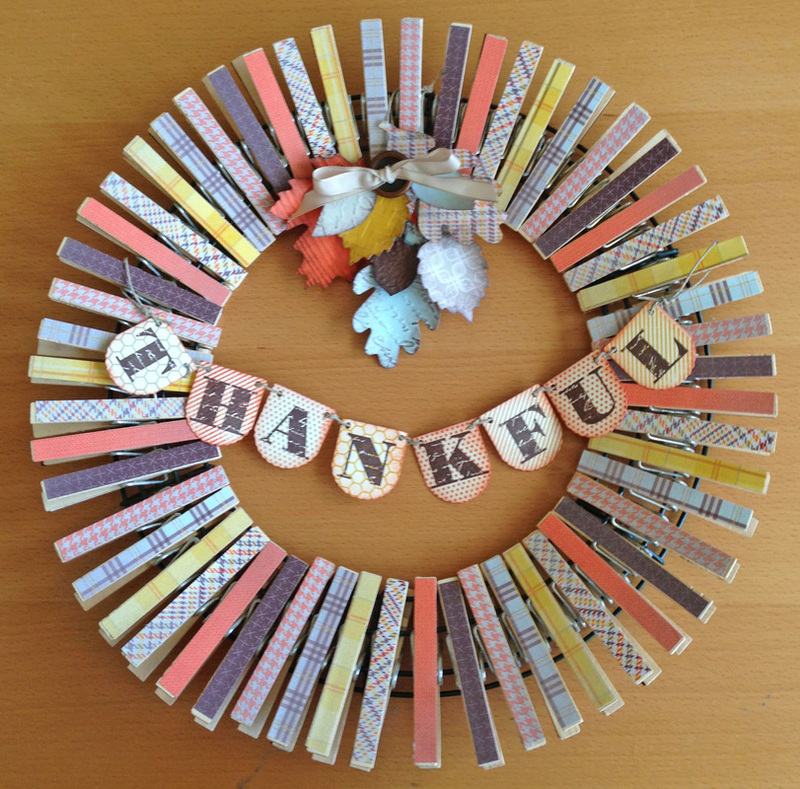 Paint and Mod Podge on wood shims makes for a fun starburst wreath. Add a touch of autumn to a summery wreath with a mini pumpkin wire garland. The more creative, the better! Thanks for visiting. Such cute wreath ideas! Pinned. I like these wreath ideas, especially #3! They are all wonderful, but number 8 is my favorite! Thank you for sharing. Added to The Really Crafty Link Party Pinterest board. A lot of great ideas! All the wreaths are so fun and creative!! Thanks for sharing these!! The pool noodle frame is amazing! I would have never guessed those were foam! Lots of good ideas here – I’m looking forward to decorating with some of them. First time here…visiting posts from “Talk of the Town.” I love your wreath ideas…love that they are a little different. Pinned & shared to my FB page. Thanks so much! My goal was to showcase very unique ideas. Thank you also for the FB promo. Much appreciated. Great round-up of fall wreaths. Thank you for sharing it with us at Vintage Charm. Thank you so much for the exposure. It is appreciated. What a unique assortment of fall wreaths! I love how people are using all kinds of interesting objects for wreaths, like flower pots and clothespins. Gone are the days when you’d just stick a few faux flowers and a bow on a wreath form. ha-ha. Nice round-up! Oh my gosh, what a fabulous collection of wreaths! I wish I had more doors! LOL, I wish I had a prettier front door! These are all so different and stylish from what we typically think of when think of a wreath. I especially loved the one with the fabric flowers. They are all gorgeous. I found this very unique wreath that deer antlers on it. This inspires me to try it. I was just thinking about where I was going to find a fall themed wreath for my front door when I seen your post. I love fall leaves more than anything; so I am definitely going to try Wreath Idea #1. It is beautiful!!! Love these pretty wreath ideas! I love all the wreaths but the one that caught my eye was the pallet wood, how nifty is that. These are all very cute. Love #5 the best. Thanks for sharing. All these wreaths look lovely! As I was born and raised in Canada as well, I do have a soft spot for the maple leaves though! Thank you for sharing this post, and for being a part of the Hearth and Soul Link Party. Pinning and sharing. So many awesome ideas! I love fall wreaths! Nice round up…. Love the ones that aren’t round. 🙂 Always looking for something different! I love all of your wreathes but especially the one made with clothespins and #10 with the little pots. It;s still very hot and humid here in Mane but cool weather will surprise us soon! Enjoy your blog! You’ve found a lovely collection. I think my favourite is the copper and felt one, so simple and modern. Love the Maple Leaf wreath! I’m originally from Canada too! There are so many lovely ideas here, I’m pinning and sharing this post around, including on the H&S Facebook page later today. Thank you for sharing, and for being a part of the Hearth and Soul Link Party. Have a great weekend, Victoria! I love the inspiration! I need more doors now to hang them all on. Have a great week!